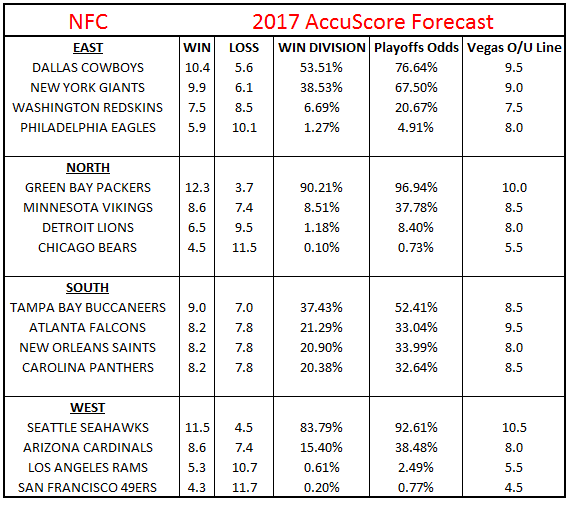 With the 2017 NFL season nearly here, AccuScore projected out win-loss totals for every team. After revealing the AFC Win Totals and picks on Monday, we're back with NFL futures and expert picks. As a reminder, AccuScore's futures picks went 3-0 a seasons ago, so it's wise to pay attention. The Dallas Cowboys are projected to edge out the New York Giants and win the NFC East behind Dak Prescott and a strong offensive line. Even with Ezekiel Elliott suspended for six games, the Cowboys still project to win between 10 and 11 games, though the Giants are close behind at 10-6. The computer has Washington staying put and replicating its 2016 record of 8-7-1, though a draw is obviously not likely. The Philadelphia Eagles are expected to finish 6-10 in a tough division that seemingly always provides a surprise or two. The Green Bay Packers are the most likely team to win their division and to make the playoffs in the NFC, as the Cheese heads project to go 12-4 and easily beat out the rival Minnesota Vikings, who are projected to win between eight and nine games. The Lions and Bears are in for losing seasons in 2017, with the latter provided almost no chance of making the playoffs. The only division where no team is projected to finish with a losing record is the up and coming NFC South. The Super Bowl runner up Atlanta Falcons are projected to finish as runners-up behind Jameis Winston and the Tampa Bay Buccaneers. Drew Brees and the New Orleans Saints and Cam Newton and the Carolina Panthers all shockingly projected to win 8.2 games and lose 7.8 games, meaning this division is neck and neck. The Las Vegas Over/Under line reinforces that the computer isn't alone in thinking this division is as close as it gets. According to Vegas, no team is projected for 10 wins and no teams is projected to win fewer than eight games. AccuScore agrees with that. While the Los Angeles Rams and San Francisco 49ers continue to be rebuilding projects, the Arizona Cardinals and the Seattle Seahawks are playoff threats. The Seahawks get a notable edge from AccuScore, as Russell Wilson and company project to finish with the second most wins in the NFC and the second highest odds to make the playoffs. Las Vegas actually set a higher win total line on the Seahawks than the Packers, so Vegas is pointing to the Seahawks to be the NFC favorites outright. Why Join Now? NFL futures, NCAA football previews, NFL Fantasy data and of course, our award winning NFL picks are all due to drop this month. It's the perfect time to join and become a member. Use coupon code football30 for 20% off All-Access All-Sports Premium membership (annual or monthly). This is the our best preseason offer & won't last long... Join AccuScore today! AccuScore has been traditionally strong in picking win totals. Last year, of course, we went 3-0. The focus is on value picks against the Las Vegas line. Members: Log in now to see AccuScore's NFC Futures Expert Picks. Not a member? Don't miss out! Use coupon code football30 for 20% off All-Access All-Sports membership... Join AccuScore Now!